After another situation in which they couldn't put together the right main event, the UFC decided to simply move a main event from one show to their January ESPN+ debut show instead. 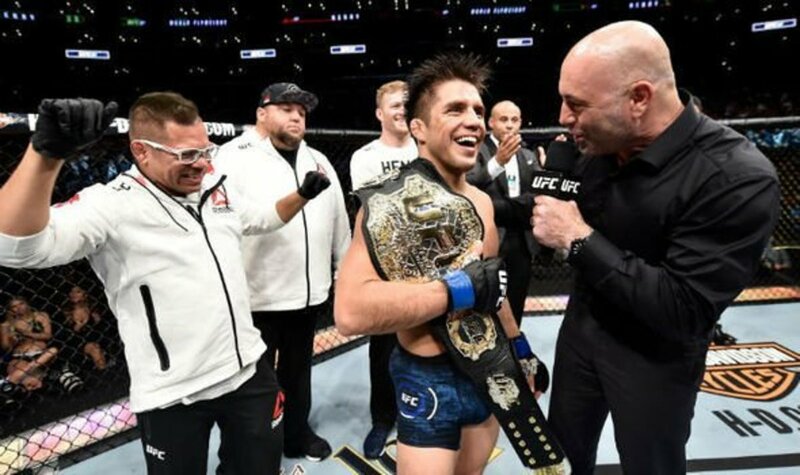 ESPN's Ariel Helwani reported Wednesday night that sources tell him the January UFC 226 main event between flyweight champion Henry Cejudo (seen above) vs. bantamweight champion TJ Dillashaw is being moved up a week to January 19th, the promotion's debut on ESPN+ in Brooklyn, NY, leaving the Anaheim, CA, PPV without a main event. Helwani said UFC tried to book welterweight champion Tyron Woodley vs. former interim champion Colby Covington for the Anaheim show, but Woodley is recovering from hand surgery. They then looked to book Covington vs. Kamaru Usman as the co-main event for Brooklyn, but Covington has yet to agree while Usman has agreed. Originally, Helwani said, UFC tried to move up the Ben Askren-Robbie Lawler fight from Anaheim to Brooklyn and make that the main event, but Lawler declined. Helwani said they will look to book a title fight for the Anaheim show, but given recent title fights and other scheduled ones, that only leaves two options: a strawweight title defense by Rose Namajunas or moving the Cris Cyborg-Amanda Nunes featherweight title fight scheduled for late-December (co-main on the Jon Jones-Alexander Gustafsson show) to Anaheim instead.